With 2016 in the books, the first month of the brand new year did not disappoint in terms of amazing weather moments. Let’s take a look at January’s extremes! January in Burlington usually brings the coldest temperatures of the season and some rather impressive, snow producing, winter storms. Mother Nature, however, did not get the memo this season. Instead of Vermonters huddling through the throes of winter, they were treated with an early spring preview. Burlington ended up eleven degrees above average in January making for their third warmest January on record. The impressive heat was not entirely due in part to warm afternoons, but instead, record warm overnights. Low temperatures in Burlington were their second warmest on record. Twenty-six morning low temperatures were above average – 9 of which were above freezing. Note that, on average, Burlington wakes up every morning in January with a temperature right around 11 degrees. 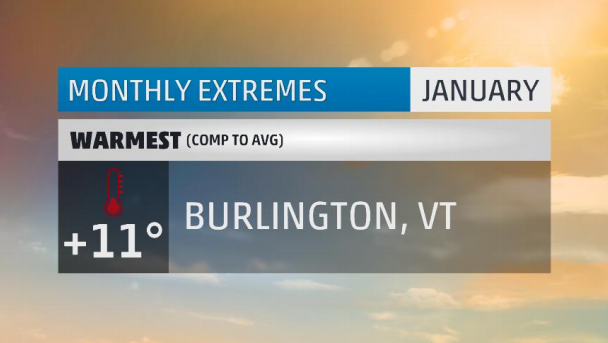 January marks Burlington’s 9th month in a row with above average temperatures. The January thaw was in full effect on the east coast US in January with over 200 reporting stations recording a top 10 warmest January on record. The sheer lack of cold weather and snow certainly left smiles on the faces of many heat misers from Maine to Texas and wistful thoughts of past winters in the hearts of cold and snow lovers. Challis sits in a narrow intermountain west valley surrounded by expansive national forests and looming mountain peaks. In a town which once claimed to have a sheep to person ratio of 6 to 1, residents of the pristine Idaho town were probably reaching for something wooly to wear this January. Although their official weather records only go back to 1999, this January was their coldest on record. 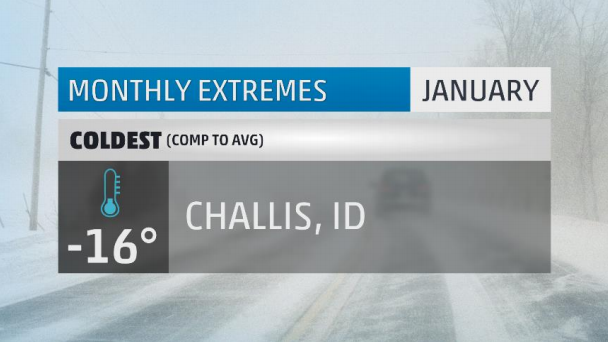 Challis’ average temperature on any given day this month was a measly 2.7 degrees! The mercury failed to climb above zero on six afternoons and twenty-five overnights. This included 13 record cold high temperatures and 14 new record lows. For 21 days straight the temperature in Challis stayed below freezing. All of this factored in to their impressive monthly temperature departure of 16 degrees. Located on the south shore of Lake Tahoe is, well, South Lake Tahoe – one of the more bustling tourist locations for scenic views, entertainment, and recreation of all kinds. Come winter season, Tahoe can get a lot of snow. The Sierra Nevada mountain range, in which South Lake Tahoe is a part, acts as a snow and cold air magnet when large Pacific storms hit the west coast. This was no exception in January as a parade of moisture-rich Pacific storms brought wave after wave of heavy snow to the mountain range. For the month, South Lake Tahoe picked up 99.2 inches of snow – that’s 1.5 Jim Cantore’s worth of snow if my Google math is right. This January will go down as the snowiest month on record for the city. Snow in Tahoe only fell on 10 days during the month, making for a close to 10 inch per day average. 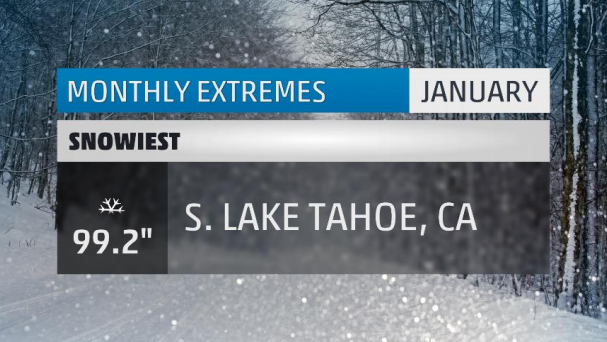 To put that into perspective, it would take New York City getting clobbered by 3.5 Winter Storm Jonas’ worth of snow (their largest snowstorm on record) to equate to Tahoe’s monster month. It’s been quite some time since the words “California” and “wettest” have been used in the same sentence. But here we are to start the year with just that – drought busting rainfall that super saturated much of the state. 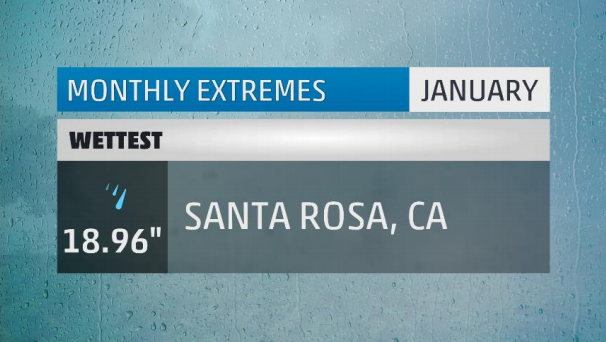 For Santa Rosa, a town in the heart of California’s wine country, enough rain fell to give them their wettest month of any month on record. Their close-to-20-inches of rain was more rain than they had seen in the past eight months combined! Lucky for wine lovers, this heavy rain in January will likely not impact the 2017 vintage as the grape producing vines are dormant for the winter. Grape growing season begins in March. 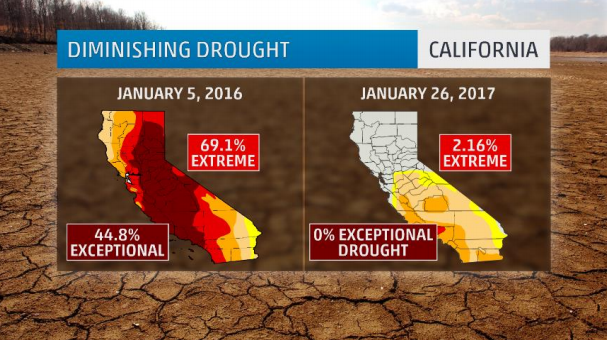 For the rest of California, January brought incredible improvements to their drought stricken landscape. Heavy rain and snow erased the state’s exceptional drought (the highest category of drought). This is not just great news for Californians who had to take extreme water conservation measures of late, but for the rest of the country as well. California grows almost all of the nation’s artichokes, walnuts, kiwis, plums, cauliflower, spinach, celery, carrots, lemons, and avocados. That’s not just a weird recipe for guacamole, but amazing news for California’s farmers and the economy as a whole. One place with not a whole lot of weather this past month was the southern Plains. Cleburne, which is an hour’s drive southwest of Dallas, had just five days of measurable precipitation for the month. 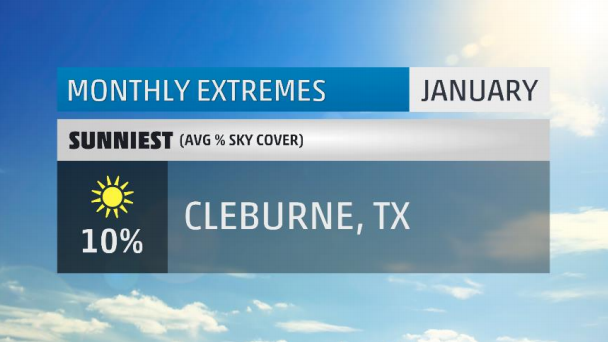 The quiet and dry weather accounted for a whopping 23 days without a cloud in the sky over Cleburne. For the month, there was, on average, only 10 percent sky cover on any given day. That’s a whole lot of big blue sky for the Lone Star State. While the southern Plains were almost weather-free, an active storm track over the Great Lakes produced days and days of gray. 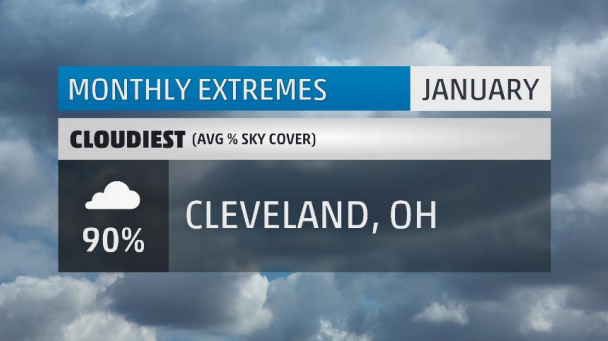 Cleveland, on the shores of Lake Erie, was socked in cloud cover for much of the month. Eighteen of January’s thirty-one days were completely overcast, and not a single day was categorized as mostly sunny. All the cloud cover was accompanied by wet weather as only five days were rain or snow free for the city. For the month, Cleveland ended up above normal for both temperatures and precipitation, but below average for snowfall. Gee, as if the Browns weren’t depressing enough! There you have it, the extremes for the month that was January 2017. See you next month for more! 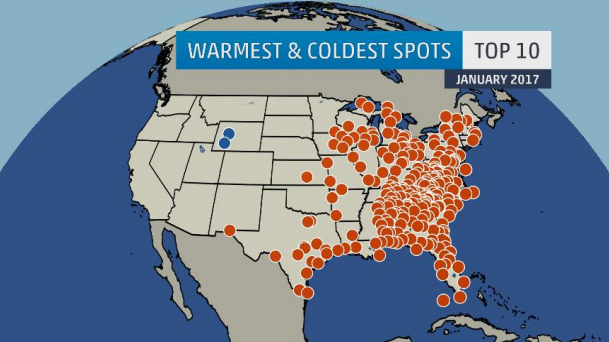 What weather extremes did you face in January? Let me know in the comments below.